A pure hit of devilishly creamy tasting hot chocolate. NESCAFE Dolce Gusto Chococino. Premium chocolate meets frothy whole milk. Intense chocolate taste with notes of vanilla. Rounded off with a deliciously dense and chocolatey froth. Premium Chocolate Meets Frothy Whole Milk Discover the indulgent-tasting NESCAFÉ® Dolce Gusto® Chococino. This isn't just a regular hot chocolate, this is an intense chocolate taste with notes of vanilla, rounded off with a deliciously dense and chocolaty froth. The combination of high quality chocolate and whole milk and the unique creamy texture ensure every mug of NESCAFÉ® Dolce Gusto® Chococino is a real chocolatey treat. 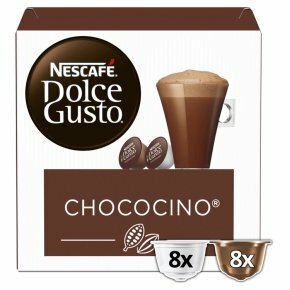 The box contains 16 capsules (8 chocolate capsules and 8 milk capsules) designed for NESCAFÉ® Dolce Gusto® capsule coffee machines for you to prepare 8 mugs of Chococino. Easy to Prepare Simply slide the chocolate capsule first and then the milk capsule into your NESCAFÉ® Dolce Gusto® machine. Your Chococino will be ready right away.